Having someone in mind the whole time can be lovely. But sometimes it can turn into an obsession. Like Love can easily turn into Hate, and the two feelings cannot be separated, thinking of someone can send positive vibes or become negative energy. In many cases, it is us who go back and forth between positivity and negativity. We all tend to forget that sometimes unwillingly we ourselves are the source of negativity around us. Self-criticism is important, just beware that it should also not turn into self-guilty. Be honest with yourself and the others. You may be at your job totally distracted from your work or at a party laughing and dancing when you feel a sudden urge of sadness or emotionality. This may be a sign that someone misses you. You may be dear to someone and your absence makes them deeply sad. Or again, you are distraught or stressed and suddenly you feel some warmth in you. This is a sign that someone cares about you and her-his thoughts are full of love and interest. Self-evidently, if you are allergic or you have a sensitivity on your eye, this is not a psychic sign and you should better visit a doctor. However, if out of the blue your eye itches, this could mean that a certain someone has thoughts concerning you. According to some approaches, which eye itches show what kind of thoughts the other person has about you. This differs between women and men. That means that if the left eye of a woman itches, someone praises her. But if she gets this sign on the right eye, someone maybe not so glad about her. For men, it is the other way around. Similarly, with the eyes, if there is no physical reason for these phenomena, you are in the thoughts or in the mouth of certain someone. If your cheeks are getting red without any reason (obviously not while you drink red wine, or you flirt!) you may be bad-mouthed by someone. The burn on the cheeks are like distant slaps and a certain individual has aggressive thoughts towards you. On the other hand, having a burn on the ears is a token that certain someone has a crush on you and you are receptive to her/his emotions. That’s nice! This is a sign that you are in the center of emotional and intensive thinking. Depending on how you feel, thoughts are positive or negative. It is highly probable that a certain person finds you extraordinarily attractive. This is a typical sign that a certain someone misses you. In many countries, people should ask their company for a three-digit number after sneezing. For example, if your friend gives you the number 246, you add the numbers 2+4+6=12= L. So, a certain Luke or Lauren is thinking of you. This is a sign that someone is complaining about you constantly. Although this person is not necessarily vicious, her or his activity is toxic and charged with negativity. Try to avoid this person if you know who this is. Thoughts of a person may be so forceful that they transmit the feeling of physical contact. This is one of several telepathic impacts that can be associated with intense thinking. If the certain someone is your partner or a person that you love (or you could potentially love) the sensation is beautiful. Otherwise, physical contact may be unpleasant and creepy. This is the state of an extraordinary connection between two individuals that emerge spontaneously and naturally. If you have the impression that you receive thoughts and ideas from another person, this person is trying to connect with you in an intimate manner. You, in turn, are either an empath or open to this liaison. Although telepathic experience can be extremely exhausting, the connection can be astonishingly fascinating and creative. Do the best out of this situation. Sending distant dreams is a subtler form of telepathy that we will discuss in a future article. Dreaming of someone’s acts and emotions suggests that this person spends much time thinking of you. Her or his thoughts are so penetrating that can get into the realm of your inner desires, wishes, and fears. This can be either intimidating or beguiling, depending on the way you regard this certain someone. Observing the signs will help you recognize that someone’s energy is directed towards you either in a positive or negative way. Surely, you should be careful to avoid any self-fulfilling prophecy. 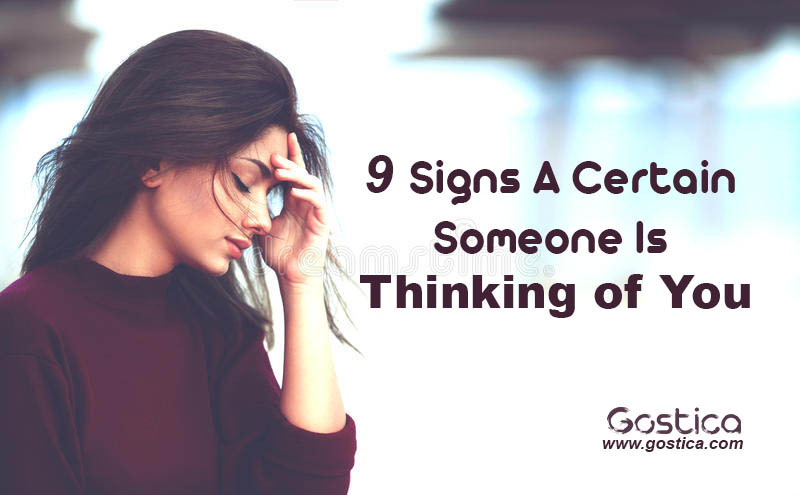 These means don’t see signs where they are not just because you want someone to be thinking of you. But do not turn them also down when these appear. I have the same connection with my ex boyfriend, to the point where the relationship was going no where and he was rude, and minipulative but we always got back together. Now we have been apart for about a month no contact but I always see signs and him in my dreams.. any thoughts? Why I’m seeing a person in my dream again and again without thinking about that person?